sending both Midi CCs and SySex is really nice. good thing I copied that novel to another app before posting! That Yamaha BT01 is something I plan to test, too. If the BT01 can clean up some cables, that would be awesome. Even more awesome would be to get the computer out of the guitar rig. $80 per cable might be a little steep. I experienced poor performance with bluetooth speakers dropping connection in the past and don't want that possibility of unreliability in my studio! Surely Yamaha have licked it. I use a footcontroller and ipad controlling my two CyberTwins simultaneously. More than that, actually. I use a MIDI merge device. 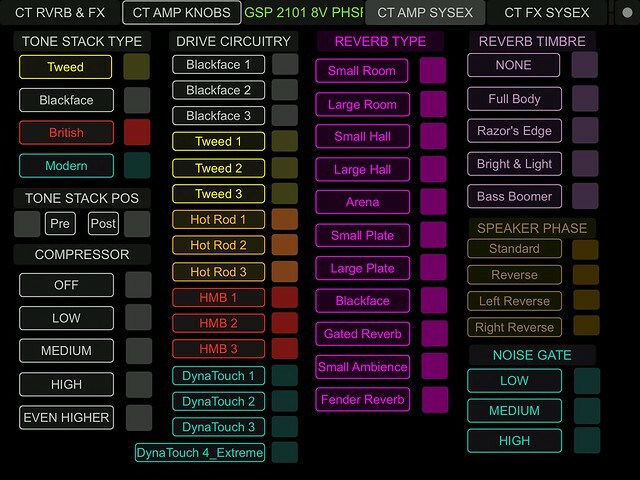 In my case, my Digitech GSP2101 is capable of acting as a MIDI merge, amongst many other functionalities. So, with one footcontroller I control the 2101, a CT FE and a CT SE (and a GLab LMS-1 line switcher). The GSP2101 FC does everything General MIDI: Program Change, CC expression and toggles. The 2101 is quite versatile in MIDI. Sadly, the CTs aren't designed to toggle...but the 2101 is fantastic with toggles (stompbox functionality). OTOH, CyberTwins have much deeper SysEx functionality. You can forget about menu diving on CT front psnel once you get SysEx control going on CT with OSC. I desire having SysEx control beyond the commands outlined in the CT manual Appendix. Before last month, those appendix spreadsheets in the Cyber Twin manuals seemed a waste of unneccessary outdated info, ha ha! and now I WANT MORE. Like remote control of CT front panel EXIT and SAVE. I did try mapping the CT encoder to TouchOSC, but it didn't work too well. It was jumping 2 clicks, but that might just be a range issue. I am going to try reverse engineering by listening to MIDI messages with MIDI-OX. I have, so far, been unable to find any Cyber Twin extended SysEx documentation beyond the user manual. Also, TouchOSC isn't the best OSC app; I am looking at Midi Designer and Lemur, too. Yesterday, I figured out how to send different SysEx messages to each CyberTwin with a single button push. I have a First Edition and an SE. I was motivated to learn this multi message method because the SE has expanded parameters beyond the FE. The Fender Cyber Twin manual instructions are terrible for SysEx Device ID to differentiate multiple devices with SysEx strings. I don't yet understand why CT gives the ability to set SysEx Device ID on the unit itself. That functionality is misleading...maybe it's based on an obsolete system? Maybe it works for some devices and not others? I don't know. !! !ensure you have backed up all your important user settings before messing around with SysEx!!! When I was investigating this yesterday, I was using my "common sense" and mistakenly setting the SysEx Device ID in the Cyber Twin UTILITY menu to match Device ID of my SysEx message syntax. The way it actually works is to set the Cyber Twin amp UTILITY to OMNI and the SysEx message syntax Device ID you set will identify the different devices. I set my FE messages' syntax to 23H and SE to 24H and separate, device specific parameters loaded reliably. Feedback from the CyberTwin and 2101 displays would be nice, but unlikely to ever happen without some insane hacking of hardware, software and firmware. It'd be easier to set up some cameras I suppose...or buy an Axe FX or Helix (not my thing). I should think there is a way to code the remote OSC app to show the last buttons pushed. Ultimately it ends up being your ears that tell you what you have set. Something thst might best sort this out is an RJM Mastermind...a very, very long way from cheap, but will probably do what I am looking for. I have started. I'm not much for making things look purdy. I'll be stoked if it works. Dude, you have some killer persistence! 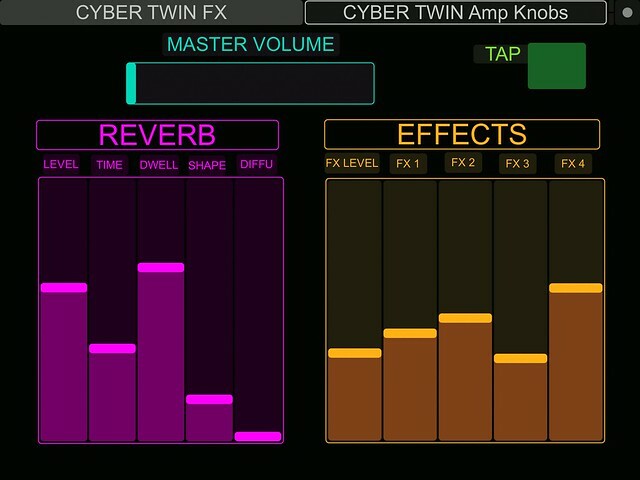 I have been working on a Ctrlr VST for Cyber Twin. When I set out to design it/ them, I didn't really grasp how to approach it. I mocked it up roughly in an excel spreadsheet. I have a CT FE and a SE. Do I send sysex to both the FE and SE with the same messages from a single button push? That scenario is going to be the most efficient for screen real estate in my DAW. But what if someone else wants to use the VST? And if they only have SE(s)? If I wanted to just treat both CTs like a First Edition CT, then it's pretty easy. The SE will act just like a FE to FE specific SysEx. Sending SE SysEx to an FE isn't a CT crash issue as far as my tests go; if the hex value is out of range, the FE will load the highest number. You just end up with unexpected results. I'm sure I would eventually figure it out, but I will probably leave that out to start with. The other issue is midi bandwidth. The setup I have been using is with my FE as the midi master and midi THRU goes to the SE...on the same MIDI channel. If each device is on a separate midi channel, hopefully the bandwidth will increase and less midi noise and delay will be achieved. a Dual Merge version where either SysEx will be delivered. Something I have found is that I typically prefer both CTs to sound nearly identical as far as amp knobs settings go, so I am only planning on including one set of amp knobs for the Dual Merge version. If different sounds are required simultaneously, multiple instances of the VST can be used in the DAW. Suffice to say, I am working on the VST and it will be a Dual Merge version to start with because that serves my current set up. Last edited by ctreitzell; 10-18-2018 at 01:10 PM. Well, Lo and Behold it works!! Anyway, my initial testing of MIDI control using Ctrlr in standalone mode works. There are some issues. I made all my knobs from scratch; I made all the faders by copy paste and some of the faders are linked no matter which settings I apply, so I may need to make all the faders from scratch. One thing that is immediately wonderful is that Ctrlr is being remote controlled by TouchOSC with me doing nothing more than setting the MIDI channel (all the TouchOSC and Ctrlr CCs are mapped to the same CC as that is the way the Cyber twin works). I was worried that I would have to write some Lua code to get TouchOSC talking to Ctrlr, but to my utter and joyful surprise, it works with without any exhaustive setup!! Just awesome. 1) bank/ program load or changes. I will need to experiment with this...the whole point of the exercise is to reduce the dropout between program changes...there is no spillover on CT, but it can kinda be dealt with on the fly. Thing is, when the DAW sequence starts...what is the CT program? I could set up a bar pre song start to apply the settings...but if others want to use this VST, they will likely want program changes...to investigate..
Way to go! And welcome to the future. Well, heck...my work on both of these has stalled because the weather out here on the ranch has been beautiful which has required my presence outside mowing and running a chainsaw. Well the rain is here and I plan to get back to OSC and DAW Sequencer control for CyberTwin and 2101. 1) I have stalled on using TouchOSC. TouchOSC works fine, yet I plan to investigate Midi Designer Pro 2. There are a couple of reasons to go with Midi Designer over TouchOSC. The first thing against using Midi Designer is that it is much more expensive (40 currency units) than TouchOSC (4 currency units). The main stumbling block with TouchOSC is code syntax for control elements is not retained when copying a layout. With nearly 200 elements per page it is a lot of work to re-label the elements per copied page. TouchOSC buttons don't have a labelling function; for buttons to work reliably, I have found putting the label next to the button works best. That scenario uses up a lot of screen real estate, doubles the number of elements on a page and is not the most efficient to use for remote control because we naturally will initially press the label rather than the button in such a scenario. Midi Designer has a label function for buttons. That doesn't mean I won't finish the TouchOSC version for SE. I will finish it and provide a link for anyone who might want to use it. My original plan with this VST was to record midi remote control CC and SysEx into DAW sequencer with OSC app and midi footcontroller and then edit if required and playback sending the midi control out to external devices. My preferred DAW for music production is Propellerhead Reason and Reason's lack of SysEx support may be the stumbling block. It is my understanding that Cubase and Reaper are much more SysEx aware. A move from SawStudio (which is my preferred DAW for audio mixing) to Reaper has been looming for a couple of years for me. I have tried moving over to Reaper a few times and I just have never taken to it. Before I dive down that rabbit hole, I am going to see what I can get out of Reason. 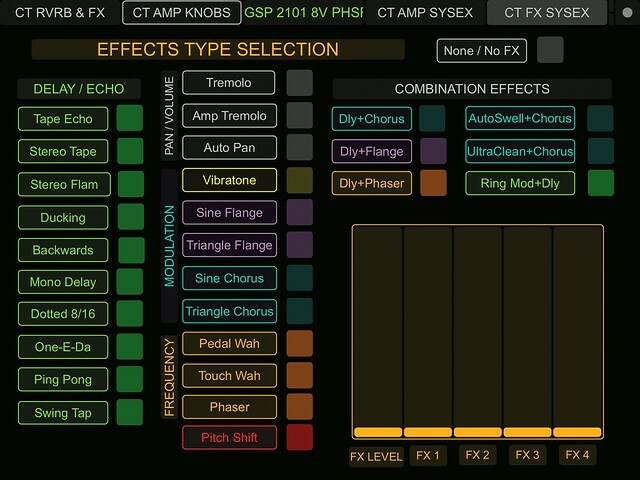 As I want OSC involved as a controller for this VST for CyberTwins and 2101. For an OSC remote app to work reliably with Reason, I need to make a Remote Map for the OSC app and the Midi Footcontroller. That means my OSC app has to be completely finished before making this Remote Map. The Cntrlr version that does work fine in Reason appears to not yet support OSC. So the search is on for the version that supports OSC in a DAW host. Also, Cntrlr dev seems to be completely dead which is another big stumbling block. 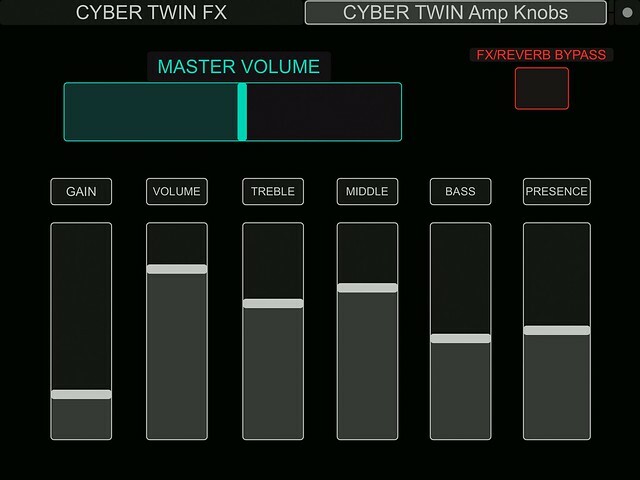 I am now 98% finished with my first CyberTwin remote control for ipad using Midi Designer Pro 2. The layout I made controls both a First Edition and a Second Edition simultaneously (that's how I use it anyway). There are a couple of foibles with it when using both an FE and SE, but I think it makes life so much easier! I am also using Yamaha MD-BT01 bluetooth wireless midi adapter which has been working flawlessly, so the only computer required is the ipad. I'll post here when it is completely finished. Anyone who might want to try it, PM me.